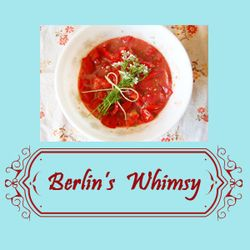 Berlin's Whimsy - Food for the Week Ahead. Food for the Week Ahead. It’s been awhile here. So much has changed in my life. I work in a library. I work full-time. And I still make things. But I’m busy. Very, very busy. My level of mid-week stress hinges upon my level of completed chores over the weekend. There are the usual chores, such as laundry, vacuuming, and such, but the chores that really affect my stress level are my kitchen chores. It’s not fun coming home at 6 PM on a Wednesday evening with nothing for dinner. Not to mention weekday mornings without lunchbox ingredients. I’m not one to run to the fast-food joint, but I am one to stop by the store and pick up dinner supplies in desperation. And that’s never a good idea for one’s food budget--- heck, for as much as I’ve spent on one of those desperate forays, we could have went out to a fine meal! So instead, I draw upon my experience working in food establishments and play prep cook. When I first started this weekly routine, I wrote down a list of items to make for the week ahead. Now, it’s mostly habit and because of that, I’m pretty efficient. I do switch it up a bit with the seasons, but I always have certain items on hand for the week ahead: homemade mayo, boiled eggs, some sort of protein (often, it’s this slow-cooker shredded chicken), fresh veggies washed and prepped, and some par cooked veggies. I don’t sit down and write up menus for the week. That doesn’t work for us. On any given evening, we might not feel like making the planned dinner. Instead, I have ingredients ready for finishing off, depending on our mood. A caveat: I enjoy cooking and tooling around the kitchen. While items cook, I browse the internet or work on a sewing project. I have friends that don’t like cooking. At all. The idea of spending a few hours on their weekend cooking for the week ahead fills them with dread, but it also means relying upon packaged and/or fast food during the week. It’s a choice. I prefer to eat healthy and reduce my anxiety, and I’ll gladly invest my time on the weekend for eating better during the week. But again, that’s my prerogative. I'll write up a list of what’s ready in the refrigerator for my kids--- it also prompts my bad memory, too! Later this week, I’ll post some of the ways I used these items!